An Oakland Hills neighbor said that Vester Flanagan was "demure" as a child. The man accused of killing a television reporter and photographer during a live broadcast in Virginia on Wednesday had worked in the news industry on and off for two decades, including at jobs in the Bay Area and Florida. Vester Flanagan II, who used the name Bryce Williams professionally, died of a self-inflicted gunshot wound following the attack against his former colleagues. Within hours of the shooting, a portrait had emerged of an anchor, reporter and producer who was talented but volatile, and who thought there was too much racism against him and African-Americans. 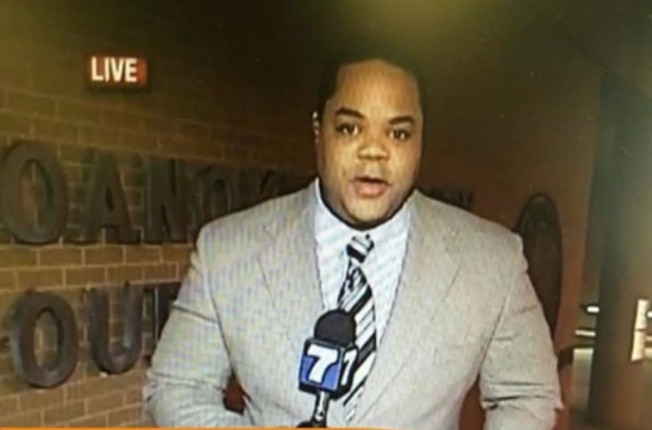 The Northern California native was described as a disgruntled employee who WDBJ7 General Manager Jeff Marks said had been let go from the station and escorted out by police in 2013 after "many incidents of his anger coming to the fore." Still, one former neighbor from Oakland Hills recalled him being "demure" and "well-spoken." Authorities say Flanagan opened fire on two former colleagues from Roanoke CBS station WDBJ7 at close range during an interview early Wednesday, killing reporter Alison Parker, 24, and cameraman Adam Ward, 27, and sending a local Chamber of Commerce official to the hospital. "He was sort of looking out for people to say things that he could take offense to," Marks said on his station's broadcast. "And eventually after many incidents of his anger coming to the fore, we dismissed him. And he did not take that well." Flanagan had also filed an Equal Employment Opportunity Commission complaint about what he perceived as racism in the workplace. And in 2000, he filed a lawsuit against an NBC affiliate in Tallahassee, Fla., alleging news producers made offensive remarks about blacks. A man who claimed to be Flanagan faxed a 23-page missive to ABC News, saying what triggered the "carnage" was the reaction to the racism and the Charleston church shooting. 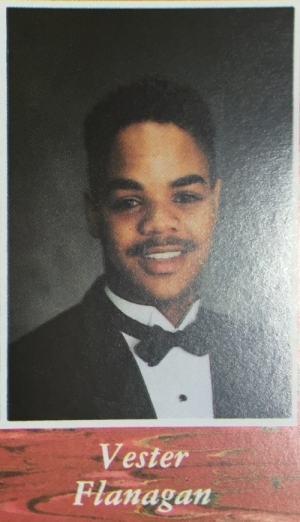 Vester Flanagan appears in a Skyline High School yearbook released by Oakland Unified School District in 1990s. Flanagan grew up in Oakland and graduated from Skyline High School, where he tweeted out days before the shooting that he has been voted the school's "homecoming prince." He interned at KPIX in San Francisco from 1993 to 1995, and then was hired in November 1996 as a casual freelance production assistant, the television station confirmed. Former KPIX anchor Barbara Rodgers, who left the station in 2008, issued a statement about what she remembered about Flanagan while working with him in the '90s. "When Vester worked for KPIX, he was just a young, eager kid out of journalism school and like so many other interns and new employees who came through there in my 30 years at KPIX, he just wanted to be on TV and to do a good job," she wrote. Flanagan's family released a statement Wednesday offering their "deepest condolences to the families of Alison Parker and Adam Ward." "Our thoughts and prayers at this time are with the victims' families and the WBDJ7 NEWS family," the statement said. "Words cannot express the hurt that we feel for the victims." Flanagan graduated from San Francisco State University in 1995 with a degree in radio and TV. Broadcast professor Marty Gonzalez had Flanagan in a class. "I don't know any faculty who foresaw this," he said. "If so, someone would've done something about it." He also worked at PG&E as a customer service representative from 2001 to 2002, the utility confirmed. He went on to work at stations in Texas and Georgia, before landing a job as a weekend anchor and reporter at NBC affiliate WTWC in Tallahassee, Florida, according to a bio published in 2012. He worked as a reporter, anchor and producer for the weekend newscast at a North Carolina station and later joined WDBJ7 in 2012, the bio said. His LinkedIn profile has now been taken down, as have his Twitter and Facebook accounts. Don Shafer, who hired Flanagan at WTWC in 1999, described troubling behavior during the suspected gunman's short time in Florida. Shafer said Flanagan was terminated from his contract for bizarre behavior in 2000. Soon after, Flanagan sued the station for racial discrimination. “He was pretty difficult to work with,” Shafer said. Flanagan appeared to turn to social media with claims of racism after the shooting, airing grievances about his colleagues and referencing a discrimination claim against his latest employer. Jarring first-person video of the attack was posted to the social media accounts, which were quickly suspended. At least one longtime acquaintance of the suspect, however, said he was shocked by the news and portrayal that emerged. Flanagan's former neighbor Virgil Barker, who lives across the street from where Flanagan grew up in the Oakland Hills, said he was "devastated" to hear about the tragedy on television. He described a young Flanagan as "demure," "personable" and "well spoken." "It's not like he's a monster," Barker said in an interview with NBC Bay Area. "It's just one of those things where he must have snapped." Barker said Flanagan's late mother was a school teacher and his dad, who now lives in Vallejo, California, was a salesman and former NFL player. His two sisters were all college-educated and became professionals, Barker said. "He came from a nice home, and had a nice family." After his mother died, Flanagan's father and sister moved to Vallejo, where neighbors also knew the younger Flanagan. The on-air shooting marked the first time since 2007 that a journalist in the United States had been killed on the job or because of their work, according to the Committee to Protect Journalists. The last slaying was the death of Oakland Post's Chauncey Bailey that year, as was reported by the Poynter Institute. NBC Bay Area's Jodi Hernandez, Chuck Coppola and John Zuchelli contributed to this report.